My husband’s response to my discovery of Kayla Itsines on Instagram was similar. “How is that BODY?” I wanted to know. “Mmm,” he mused, “great stomach but her legs are too skinny”. 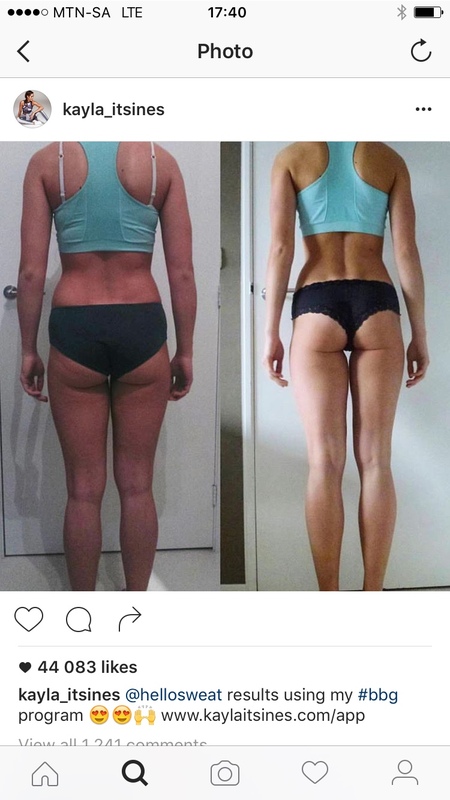 I had no idea who Kayla Itsines was, when I created an Instagram account in January. I was on a mission to shed a few kilos after the holidays and I started following a lot of fitness-type people. The hashtag “bbg” was all over Instagram. In fact, it was so widespread that it became very difficult to uncover the actual meaning behind the acronym – it had become part of the everyday lexicon of approximately 4 million people by then. After some digging, I discovered that it stood for “bikini body guide” – a workout and eating programme that one could purchase online if one wanted to look like Kayla. And one does – want to look like Kayla, that is. Skinny legs and all. According to interviews, Kayla dropped out of university to become a certified personal trainer. Her rise to female fitness stardom began when she started posting pictures of her clients’ body transformations. When I started following her, I was inundated with “before and after” photos of women in bikinis, underwear or skimpy active wear. There were a fair number of Brazilian-style bikini butts: those bathing suit bottoms that aren’t quite dental floss but that don’t leave much to the imagination either. With her beautifully bronzed bod, a name like “Itsines” and a bevy of transformed online clients, posing in next-to-nothing, with the kind of sass that I imagined only South Americans can muster, I assumed that Kayla was Brazilian. Not so: she was raised in Adelaide, Australia, by Greek parents, hence the olive skin and year-round tan. After a while I didn’t think I could, er, stomach another Kayla selfie… Those legs… those abs… they were just too nauseatingly perfect. (And did I mention that she doesn’t drink alcohol at all, ever?) The interesting thing was, however, that many of her online clients around the world, looked about as good as Kayla in their “after” photos: ripped stomachs, defined arms, toned legs. Obviously, for every successful transformation posted, there must be hundreds or even thousands of drop-outs who bought the Bikini Body Guide and didn’t get anywhere near to achieving their dream bodies. But tons did. And I am pretty sure I know why – besides having an online Greek goddess for inspiration. In 2006, I was attempting to lose weight for my wedding with Weigh Less. There was a free personal training session up for grabs for the person who lost the most weight in a particular week. I dutifully showed up at the next meeting, climbed on the scale and hadn’t lost a gram, but I was in the fortunate position of being the only person who actually attended the group meeting, so the personal training prize was bestowed upon me. I pitched up at the gym all eager for my freebie workout. Instead, I was subjected to a body assessment (hooray) and sales pitch. The monthly cost was way beyond my budget at the time, but I decided to go ahead. It was a turning point in my life, in the sense that the trainer got me from doing zero exercise to working out at least two or three times a week. Since then I’ve seen a personal trainer twice a week for the better part of ten years. I can recall eight different trainers offhand. (Almost all were good, I just like to mix things up). The thing is, not one of them handed me a nutrition plan and told me that if I didn’t largely stick to it, I would wouldn’t see results. The fact that transformations are at least 80% diet, is not new to anyone, but personal trainers don’t seem to recognise that if they don’t devise eating plans – even generic ones – and spend five minutes of every session monitoring diet, most of their clients will never see results. In my opinion, personal training in the traditional sense needs to radically change. As for Kayla’s 28 minute home work-out session, I thought it was devised for people with time-consuming careers, long commutes, no childcare etc. But going for an early morning run in winter is ridiculously hard and even making it to the gym before the school run is a challenge in the cold and the dark. So last week I decided to do Day 1 of Week 1 of the Bikini Body Guide. I was literally stiff for five days..
Nats, I can’t wait to read the next article! Very inspiring my friend. Keep posting, keep BBGing, you’ve got it going on, SuperMomma! Lol those abs really put me off! I have been to a gym before but never a personal trainer. Good luck in your fitness quest!